There is something about eating sushi that keeps people coming back for more. It has become such a popular cuisine that consumers no longer have to go to an expensive restaurant to buy it. It is now commonly stocked as an everyday item in local grocery stores. Frequently, markets will label sushi as containing “sushi grade fish”, but what does that mean for consumers? Understanding this label will help sushi lovers to protect themselves and be more aware of what they are eating. 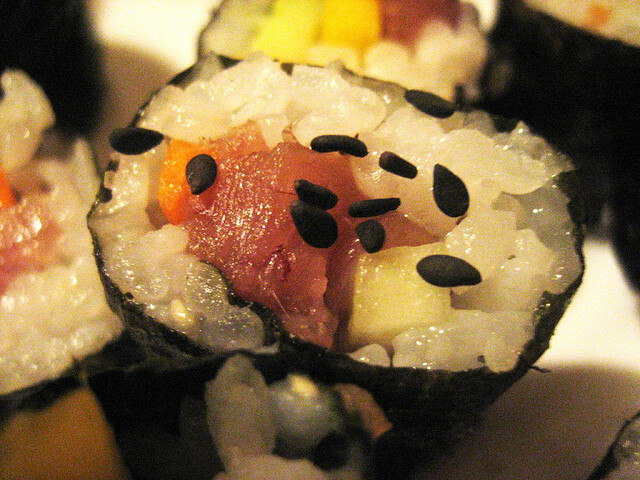 Sushi can contain various species of both raw and cooked fish. Raw fish consumption is what is of concern when labeling a product as having sushi grade fish. Fish that is unsafe to eat often has high levels of mercury or may have been harvested in polluted waters filled with toxins. There also exists the concern that there may be bacteria, parasites and other food borne illnesses that can be acquired or transferred from cross contamination throughout the food preparation process. To minimize health risks to sushi consumers, more accurate labeling will assist in preventing people from becoming sick, and give consumers the information they need to make better informed decisions on what they eat. Currently, the sushi grade label is considered to be misleading to consumers. When customers see the grading label, they often assume that it means that the fish is safe to eat in its raw form. Because there is no standard definition of what “sushi grade” means and there is no regulation by government agencies, consumers can be misinformed by such labeling. Presently, there are no identifiable quality standards that have been recognized to verify that a fish is of a superior grade for consumption. Standardizing the definitions across all retailers and agencies dealing with the production of sushi grade fish is one way to improve accurate communication with consumers. In addition, implementing a customary fish processing method among retailers, aimed at reducing the risk of parasites in fish will help minimize health hazards to sushi shoppers. It is suggested that labels inform customers of the origin of the fish, which would include where it was harvested, and when, to prevent raw fish from polluted waters being distributed and sold. Similar to the beef industry, making the sushi market safer for consumers will likely involve requiring that retailers adhere to compliance regulations and have mandatory hazard analysis performed by external inspection officials. These days, people can easily go to their corner market and buy sushi at any time. With better guidelines and definitions being standardized in the future, people will have a better understanding of what is considered sushi grade fish. The average customer will be able to buy sushi with the confidence that they are eating something that has been produced and handled in a way that is regulated and is as safe for them as possible. Jeff Rudie is a writer at Catalina Offshore Products who enjoys sharing information on sushi grade fish, sushi labeling, sushi making tips and recipes as well as guidance on where to go to find high quality fish for your next sushi adventure.